The digital disruption of incumbent financial services in Australia has, up to this point, been less extreme than in the UK and US markets. This is partly because the regulatory environment is not particularly tech-friendly. Many FinTechs have said that developing in Australia is difficult because the differences in the regulatory environment between Australia and elsewhere in the world restricts the ability for any products or services developed to be accepted globally which is, of course, the ultimate aim for any FinTech disruptor. Furthermore, the Australian retail banking environment is incredibly concentrated, with the four top banks (ANZ, NAB, Commonwealth Bank and Westpac) dominating more than 80% of the market. This is all beginning to change. Acorns, the micro-investment app, launched in February and was downloaded 70,000 times in two months. Similarly, digital mortgage broker LoanDolphin wrote more than double the amount of loans than the average lender in the two months to the end of March. Rapid increases in customer demand for digital financial services combined with observations of the potential economic benefits of a thriving FinTech sector have encouraged both the government and financial services providers to rethink their digital strategies. In the 2016 budget, the Australian Treasurer Scott Morrisson said that “FinTech is lubricating the diversification of the economy” and that he wants to create an environment for Australia’s FinTech sector where it can be both internationally competitive and play a central role in transforming the Australian economy. For these reasons, the budget includes a FinTech program that aims to promote Australia as a hot house for financial services and highlight its innovativeness to the rest of the world. If this program of investment and regulatory release works as well as anticipated, it is clear that there is going to be a boom in the Australian FinTech industry. As such, the incumbent providers likely have only a small window of opportunity to establish themselves in this space before they are subject to the level of disintermediation experienced by their overseas colleagues. ANZ has made it very clear that it does not want to miss this window and that it wants to ensure it is delivering the services that customers want. In the digital space, this definitely includes ‘additional means of making payments’ – Australians are already some of the keenest adopters of contactless technology in the world with 60% of all card transactions being contactless, compared to some 20% in the UK. Consequently ANZ launched its Mobile Pay service for Android customers in February 2016 and followed this up in April by becoming the first bank in Australia to offer its customers the Apple Pay service. This makes it the only bank in the region to offer NFC-enabled payments to almost all smartphone users. 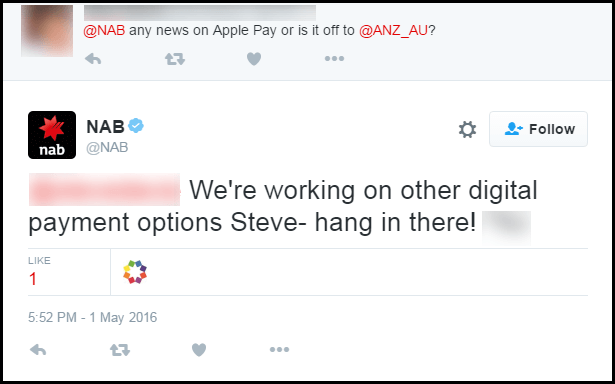 ANZ CEO Shayne Elliott joked that the Apple Pay deal had come about after 18 months of negotiating because he was “sick of being hounded on Twitter by customers asking for the service.” Whilst this was a funny comment delivered in a staff briefing it has an element of truth. Elliott went on to say that with the bank aiming to be more customer-centric they couldn’t continue to ignore the demands of their customers and it seems that its competitors are already receiving negative feedback from their customers for not offering the service. 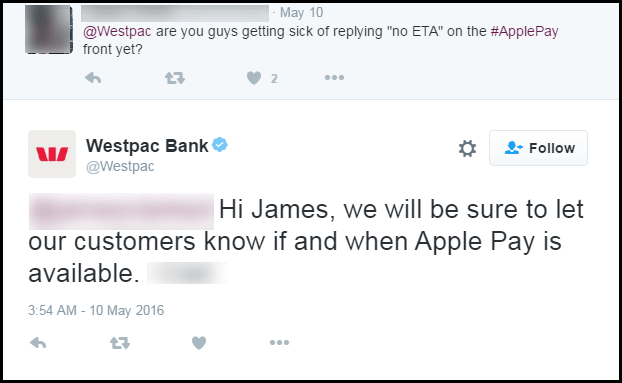 On the day that ANZ made its announcement, the social media channels of NAB, Westpac and Commonwealth Bank were all being inundated with demands from customers, asking when they too might be able to make use of the service. It has continued since. It’s clear that Australian consumers are impatient to get their hands on the latest financial technology, and the Australian government is determined to help businesses meet this demand. ANZ has made great inroads in developing its services to ensure it stays ahead of the competition, but it will need to invest in areas outside of payments to maintain its current market-leading position. Meanwhile, its competitors will have to race to catch up.